Katy Brooks is having a lousy day at work, but when a courier delivers a letter with news that her aunt has died and left her estate to her only niece, everything is about to change. Katy doesn’t remember much about her aunt, but traveling to another state to see about her inheritance can’t be that much trouble—or can it? Noah Sanders is a small-town attorney with a big problem. He needs to convince Katy to accept some rather unusual terms written into her aunt’s will—terms that mean she will have to stay in Lilac Hills, much to Noah’s delight. He’s instantly smitten with the saucy city girl, but her deep dislike for lawyers is only one hurdle he’ll have to get past to win Katy’s heart. An even bigger obstacle is her aunt’s beloved dog, Jasper, and his frequent disappearances. It’s going to take more than a mischievous collie and a little mistletoe to bring these two together, and a Christmas fundraiser that could save the local animal shelter from closing might be just the ticket. 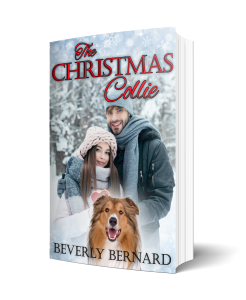 The Christmas Collie is a sweet, wholesome love story with a few surprises thrown in. BUY NOW: Amazon | Barnes & Noble | Apple More storefronts coming soon!